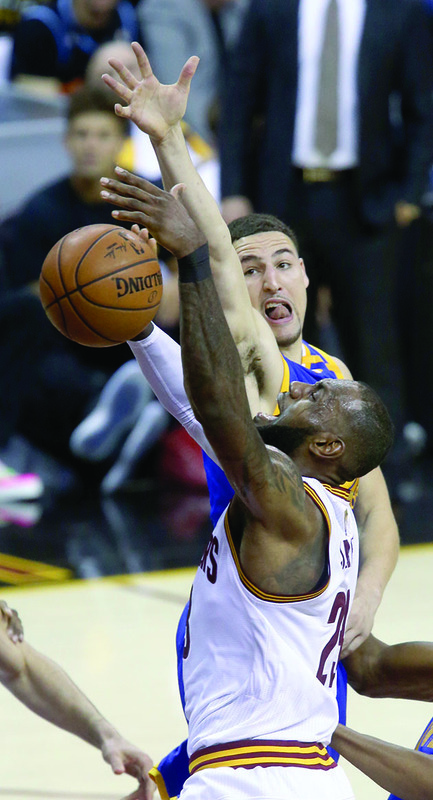 History is being made as the Cleveland Cavaliers and Golden State Warriors meet again for the National Basketball Association Finals for the third straight year in a row. Game 1 and Game 2 were played in Oakland, California June 1 and June 4, respectively. Kevin Durant and Steph Curry have been unstoppable together. The Warriors took Game 1 and Game 2 in front of an enthusiastic crowd ready for their home team to claim the ring this year. The Warriors won Game 1 113-91. Kevin Durant had 38 points, making three three-pointers, grabbing nine rebounds and eight assists. Steph Curry had 28 points, shooting 11 for 22 from the field, making six of his 11 three-pointers and handing off 10 assists. Draymond Green also came through for the Warriors with 11 rebounds. For the Cavaliers, LeBron James had 28 points, shooting 9-20 from the field, making two three-pointers and eight for 12 of his free throws. He also grabbed 15 rebounds, three of which were offensive, and tallied eight assists. Kyrie Irving had 24 points and made three three-pointers. Kevin Love had 15 points, made three three-pointers, all of his free throws and 21 rebounds, five of which were on offense. The Warriors outscored the Cavaliers every quarter, had 12 steals compared to the Cavs’ zero, and only four turnovers compared to the Cavaliers’ 20 which ties an NBA Finals record for the least number of turnovers in a game. ”Twenty in the Finals is not going to get it done,” Kyrie Irving said. The Warriors had a better shooting percentage from the field and made more of their three-pointers when it counted. ”We did a great job of covering the three-point line but other than that they played a hell of a game,” LeBron James said. The Cavaliers left Kevin Durant wide open for six slam dunks in the first half. Steph Curry is now the fifth player in NBA history to record 300 career playoff three-pointers. The Cavaliers came back with more of a fight for Game 2 June 4, but the Warriors still came away with the win 132-113. Kevin Durant had 33 points, shooting 13-22, making four three-pointers, having 13 rebounds, three steals and five blocks. Klay Thompson poured in 22 points, shot 8-12 from the field, made four three-point shots and had seven rebounds. For the first time in NBA Finals history, two players, LeBron James and Curry, both had triple-doubles. Curry had 32 points, made four of his 11 three-pointers, all 14 of his free throws, grabbed 10 rebounds and handed out 11 assists. LeBron James had 29 points, shooting 12-18 from the field, capturing 11 rebounds, 14 assists and three steals. Kevin Love scored 27 points with seven rebounds, Kyrie Irving had 19 points with seven assists. The Cavaliers were only trailing by four points at the half. They had 15 steals over the Warriors’ five and only nine turnovers compared to the Warriors’ 20. They took more shots, but did not shoot as well as the Warriors did. The Warriors had seven blocks compared to the Cavaliers’ one and hit 91.7% of their free throws. Their largest lead was 22 points. James now has eight career NBA Finals triple-doubles to tie Magic Johnson. Steph Curry made all 10 of his free throws in the first quarter which ties with Paul Pierce for most in a single Finals quarter. At the conclusion of Game 2, Klay Thompson recorded his 78th postseason game of his career to move past Jeff Mullins, a former Warriors player from 1966-76, for the most postseason games played in franchise history. Game 3 was played in Cleveland June 7. The Warriors finished an exciting game at 118-113 to lead the series now 3-0. Kevin Durant finished with 31 points, shooting 10 for 18 from the field, making four three-pointers including the defining shot that put the Warriors ahead 114-113 with 45.3 seconds left to play. Durant also went seven of eight from the line, grabbed eight rebounds and four assists. Klay Thompson had a great night with 30 points, shooting 11 for 18 and making six three-pointers. Curry had 26 points, making five three-pointers, all of his five free throws, grabbed 13 rebounds, and tallied six assists. Draymond Green came away with eight rebounds and seven assists, while Andre Iguodala grabbed four steals. LeBron James continues to lead the Cavaliers with 39 points in Game 3, shooting 15-27 from the field with 11 rebounds and nine assists. Kyrie Irving followed right behind James with 38 points, making all six of his free throws, but missing all seven of his three-point shot attempts. Kevin Love only recorded nine points, but grabbed 13 rebounds and had six steals. Throughout this game, there were 19 lead changes and 10 times where the two teams tied. Overall, the Cavaliers had fewer turnovers than the Warriors, but could not follow through on their three-point shots. The Warriors made 91.7% of their free throws taking easy points away from the Cavaliers and hit close to half of their three-pointers. After trailing by six points with only three minutes left to play, Kevin Durant helped the Warriors take back the lead with 14 points in the fourth quarter. This marks the Warriors’ 15th straight win in postseason play which is the most ever for any major professional sport. Steph Curry has made at least one three-pointer in every one of his 73 career postseason games thus far. The Warriors had nine three-pointers in the first quarter alone which broke an NBA Finals record previously held by five teams including the Warriors themselves back in 2015. LeBron James is now in fourth place only a single point behind Michael Jordan on the NBA Finals scoring list. He is now the first player to ever appear in 20 or more NBA Finals matchups with two franchises. Game 4 is scheduled for June 9 in Cleveland at 9 p.m.